So you're on a road trip with three friends, and things have gotten combative. You were thinking it'd just be you and your pal Waluigi, two buds taking some time on the road to catch up, but no; he had to invite along that annoying little punk Toad and his half-sister Princess Peach. So now the four of you are crammed in a car, moving forward in fits and starts, constantly battling your way through a road trip that never ends. That's not actually the plot of Mario Party 9, which comes out for the Nintendo Wii March 11th. The real story is something about Bowser stealing a bunch of stars, breaking them into mini-stars, and then forcing our heroes to engage in a minigame-laden road-trip from hell just to get them back. Or to become superstars. Or something. But that doesn't matter! It's really all just an excuse to cram four players together and make them engage in a whole bunch of simple party games. And more importantly: it's fun. Yesterday, I headed over to meet up with Nintendo in downtown San Francisco to spend some time playing Mario Party 9. During my time with the game, I worked through the better part of an entire stage, facing three other players in a grip of mini-games, as well as a lot of road-trip shenanigans in between. The setup is this: Up to four players climb into a goofy round car together and set off down a track in one of the game's five worlds. (There are actually seven, but two must be unlocked). The tracks are more or less like game-boards—there are a set number of spaces, and each space has some sort of prize, effect, or game attached to it. Players take turns acting as the "captain" of the group—the captain rolls a die (this is performed by shaking the Wii remote around, of course), which decides where the car will end up. A lot of things can happen on the track—the car can be redirected, hit bombs, drive over mini-stars (which are then awarded to the captain currently driving the car), or land on a mini-game, which tosses players into a mini-game of the captain's choosing. There are 80 total games, and while I wasn't sure if the mini-games are generally selected randomly, it seemed as though they were. Seeing as how I was only able to see about 1/16th of the minigames (if that) during my brief time with the game, I can't speak too authoritatively on how deep Mario Party 9 is. But of the games I saw, there was a healthy variety of game-type. In one, players fought over musical chairs-style holes in the floor, and the odd-man out got smashed by a huge crushing stone. (In my case, it was odd woman out—I was playing as Peach and got supremely squashed.) In another game, we raced bullet bills along a Mario Kart-esque racetrack. A third had us frantically matching button prompts to guide our characters up a cliff-face. One of my favorite games was designed around psychological warfare. The four players each stood on one of four ends of what was in essence a giant revolving D-pad. Each round, a giant granite Whomp slams the character in the far spot, and so no one wants to end up in that spot. At the start of the round, each character chooses whether he or she would like the platform to revolve once or zero times. Depending on what your neighbors choose, you could wind up safe—or you could wind up Womp-meat. That Whomp-stage was actually a group boss level, some aspects of which are new for Mario Party 9. At two points in each stage, players will face off against a boss in a unique boss level. All four of them will have to take down the boss character, thought they'll still be competing with one another, since stars are awarded at the end of the stage based on who did the most damage to the boss, as well as who avoided taking damage the most effectively. The goal of the game is to end with the highest number of mini-stars. Mini-stars are awarded for winning mini-games, but they're also given out for other things. 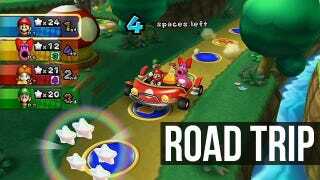 For example, mini-stars litter the gameboard, and whichever captain is driving the car when it passes over them is awarded the stars. Careful though, as the track is also dotted with bunches of purple "mini-ztars," which will cost the driver that number of stars. The entire dice-rolling system for Mario Party 9 is funny and fun. It's possible to pick up custom dice—for example, a die that only has the numbers 1, 2 and 3—which can come in handy if you have a space that you'd like to avoid, or a far-away one that you'd like to hit. If you don't care for the whole car-based board game, all of the 80 minigames can be accessed a la carte from the main menu, or played in any of a number of small, predetermined combinations. Towards the end of each stage, Bowser super-charges several of the spaces. Landing on a Bowser spaces causes him to spin a wheel of fate that attaches huge stakes to the next minigame. Until we reached the Bowser section, I had been sitting strong in first place, but after losing a Bowser challenge I had to give half my stars away. Just like that, I went from first to last place and never recovered. Dice-rolling seems like an appropriate core mechanic for Mario Party 9. This game has a high luck-factor, and is very much a party game that places more emphasis on "party" than on "game." That is to say, it's more about fun than fair competition. There were enough 11th-hour flips and turnabouts in my 55-minute preview session to make it clear that chance will be a large factor in the outcome of every game. There is certainly a skill element—though some of the minigames rely more on skill than others—and more than that, there's a strategy element. You can choose games based on which you think you'll do well at, or think through your dice-rolls so that the person after you will wind up landing on a bad square or setting off a bomb, and other strategies like that. But when it comes down to it, and especially when Bowser Challenges get involved, a lot of Mario Party 9 is decided by lady luck. Back in school, we had an expression about the drinking games we'd play. "You don't 'win' a drinking game." Because you don't, right? You play, and then you get drunk. Everybody wins! It didn't matter which game, it could be quarters, or beer-pong, or some crazy game we'd made up—the point was to drink with friends; the point was to have fun. Mario Party 9 feels much like that. Yes, there are rules, and yes, there are winners. It'll encourage a good amount of smack-talking, and there will be the odd player who takes it too seriously—this guy will be the Mario Party equivalent of the party guest who gets aggro about how amazing he is at beer-pong. But things are kept just random enough that everything feels light. Just like those drinking games, the point isn't really to win or lose; the point is to play and have fun. And like a good party game should, Mario Party 9 encourages players to do just that. And, come to think of it, it could also inspire some really good drinking games.